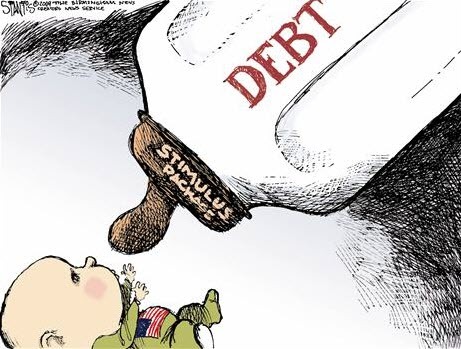 Home › National Debt › Congress has raised the debt ceiling 74 times in 49 years. In politico-speak, “ceiling” must mean….what exactly? Congress has raised the debt ceiling 74 times in 49 years. In politico-speak, “ceiling” must mean….what exactly? It is for that reason I am 100% confident that Congress will do the wrong thing and raise the debt ceiling for the 75th time in 50 years. In the end there will be some kind of phony compromise with each side claiming victory. The ceiling was first imposed in 1917 as part of a deal that passed the Liberty Bond Act that funded America’s entry into the First World War. To make it easy for the Treasury to sell those bonds, Congress also amended the Federal Reserve Act to allow the Fed to hold government bonds as collateral. But given the potential for unchecked Federal deficits, Congress sought to limit taxpayer exposure to $11.5 billion. The problem was that Congress never passed a law to prevent future Congresses from raising the ceiling. And even if it had, that law could have been rewritten by future legislation. Sure enough, when the Second World War rolled around the debt limit was raised frantically, leaving it at $300 billion by 1945. But believe it or not, after the War ended, the limit was actually reduced to $275 billion. Despite the costs associated with the Korean War, the next increase did not come until 1954. And over the ensuing eight years, the ceiling was raised seven times and reduced twice, finally getting back to $300 billion in 1962. Since then, Congress has voted to raise the ceiling 74 times without a single reduction. Practically speaking, a ceiling that is raised automatically is no ceiling at all. Given that, why not dispense with the pretense? The reason is politics. No Congressman wants to be on the record voting for unlimited debt, yet most are willing to rail against fiscal recklessness while raising the ceiling every time it’s reached. Any Congressman who gives lip service to a balanced budget Amendment but votes to raise the debt ceiling is a hypocrite. Peter Schiff from Capitalism Magazine.